applestar wrote: (I have two, one is ready to go) but you can see my history and level of experience right here. Rolling Eyes No, I'm not selling mine, but my point is made. Ozark Lady wrote: Apple, did you make your own spawn? It turns out I have three bags. Two from 1/11, described in an earlier post, one of which is a Paper Towel substrate, that are ready to go, and one from the beginning of the month. These are all third generation leap-frogged spawn from the original spawn purchased back in November. Last edited by applestar on Sat Feb 13, 2010 1:39 pm, edited 1 time in total. And most irritating is I'm having great difficulty finding a supplier in Spain- I must have tried about 40 different search strings on google last night and didn't get anywhere. Anyone able to suggest anywhere online that I could buy these? If you can't find any in Spain. How about doing research on growing your own. Then just take a walk out in the country, at various seasons, and a good mushroom guidebook, lots of waxpaper, or brown paper bags, and get your own mushrooms. Once you get a positive id... the mushroom is a good one... start your own culture. I wonder if mushrooms from the grocers still have spores and can be induced to grow from them? You may have to get "creative" and do-it-yourself! Looks pretty good doesn't it? Things are definitely growing in there. But actually, there have been some mold contams. I have to prep more agar and see if I can manage to clean up the cultures. For the time being, I've excised the mold and wiped down with alcohol but I'm not entirely sure if that was enough. 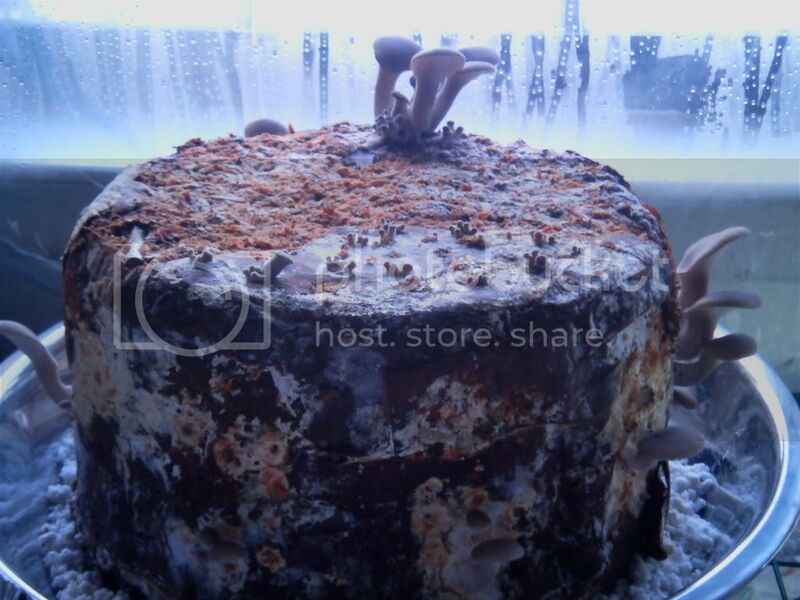 There are two that are still completely clean and showing vigorous growth (Happily, one of them is a Shiitake spore culture); another one is clean but is very slow growing and may indicate unseen (bacterial) contamination. As much as I recommend the ready-to-grow spawn for first time set-yourself-up-to-succeed experience, as you can see, you *can* learn to grow them from spores, clone them, or propagate them from stem butts. If you decide to do this, get the freshest mushrooms you can -- from a farmer's market rather than a supermarket/grocery store. We're approaching the spring mushroom season, so you'll have plenty of chances to experiment. Although it's entirely possible that my agar cultures could fail completely in the near future, at least I'm getting to practice. I'll figure it out yet. Okay Apple, I have questions..
Where did you get the neat containers? What is the cultures growing on? Is that what agar looks like? I thought agar was a gel type thing? If you mean the ones with taped shut glass lids , they're Weck canning jars and Lehman's has them. They're used with rubber gaskets and come with plastic lids for storing opened jars. They're ridiculously expensive compared to Mason and Ball jars, but I really love the way they look and work and I get a few every so often. They are only good for Hot Water Bath and Steam canning. Pressure Canning skews the rubber gaskets off the rim. The squat ones are Ball canning jars -- I think these are new designs. I used a piece of ziplock freezer bag with the ring. I've put the large block of spawn originally growing in the pasta pot insert outside. Another experiment (of course! ) -- broke it up and packed it mixed with wet straw in a largish corrugated cardboard box, which was just the right dimension to fit stacked flakes of straw. Luckily it rained today so the CCBbox was also completely soaked, as was the pile of straw that I covered it with. It's sitting in an area of the garden that I'm pretty sure will remain mostly shady and relatively moist since there was a big puddle there already. I have to figure out what to do with the spores and clones. 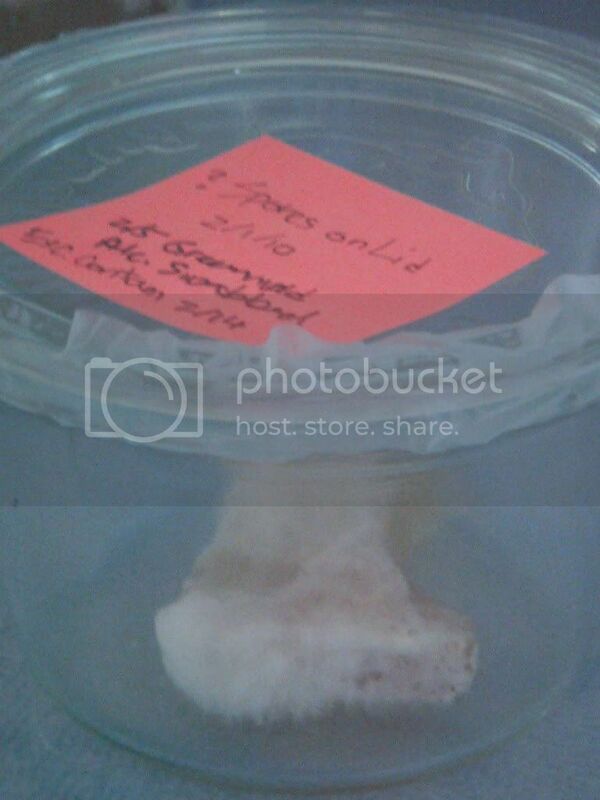 I have one of the jars in front of me -- Oyster spores grown on Rice Syrup Yeast Agar -- that has been completely taken over by green mold. The others are still doing well -- some have thoroughly colonized the agar block -- in the original jars inside my "clean room" tub. They need to be "leaped off" to the next substrate. Things are getting pretty busy around here with spring seed starting and all, but I should really try making some grain spawn, THEN figure out what to do after that. Grain spawn is fast growing and good for inoculating bran fortified sawdust substrate or wooden plugs. Sawdust spawn is good for inoculating logs and stumps (especially if the sawdust consisted of same wood species) though you need proper tools to inoculate logs. Plug spawn is the easy way to inoculate logs -- all you need is a drill and a rubber mallet with beeswax or cheesewax to seal them in. I still really want to start some Shiitake on oak logs. I have to get those branches cut down and order some shiitake plug spawn. I emailed Field and Forest for strain recommendations and they said if I start them early spring this year, they should fruit next summer. I'm forced to make some budget cuts, so I'm foregoing the H. ulmarius/Garden Oysters this year, but will continue to experiment with the Pearl Oysters since I've got so much growing. (My concern is that the very aggressive nature of these Pearl Oysters that make them relatively easy for a beginner like me, might mean they'll "take over the garden".... or not. Maybe it'll mean they'll survive, despite me and all my bumbling and become a welcome addition to my garden edibles. I am not familiar with growing mushrooms. But, oyster mushrooms are not invasive in a woodland setting. I find them once in a great while growing on a log, or dead tree. Usually there is just a nice clump, and no more. And often when you return, nothing. So they do not take over when they are in the 'wild'. I have walked and looked repeatedly, it must still be just a little too early for mushrooms here yet. I know that coral mushrooms come out early, but they are not so common here. If you ever find them though, they are tasty. They literally look like corals growing, many small fingers all pointing upward. You don't really want the brown looking ones, they are past their prime, the whiter the better taste. I just can't wait for oyster and morel season here, and I am seriously considering ordering some. But, Apple, you are probably right, with my garden kicking into full gear. I got that peach tree pruned today, whew, just in time, the apricot tree already has leaf tufts showing! And my daffodils are in bloom! Hey granddaughter is 6 and turning into a gardner... she saw something growing, said, "grandma, garlic is growing in the path". It was egyptian onion that had escaped, but she was close! How do mushrooms do in summer? If we hold off while in garden frenzy, during the lull, when they are all growing, we might find some time for mushrooms. Last year i planted winecap and blewitt mushrooms in the woods behind my house in wood chips. I did see the mycillium gwing but i never got a mushroom...I suppose the deer prints tell the tale or tail. this year i am trying again with plugs in a shaded bed against the house with onions and garlic in it. That way I'll be able to keep a better eye on it and keep it moist easier. Ooh! SoundS great! That book is so inspiring, isn't it? I hit a snag in my plans last year when I realized I couldn't cut the necessary myself without considerable effort and difficulty. Good luck with your project! Maybe start a thread and keep us posted of your progress? I'm sure I'm not the only one intrigued and hungry for more details. Geat thread Applestar! Have you had any more success with your own spawn? 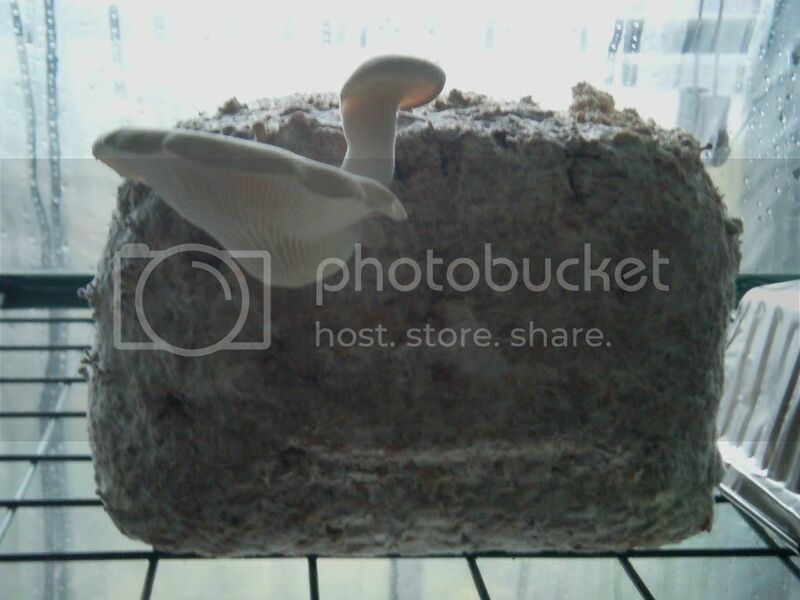 I think I am going to try some plug spawn from fungi perfecti and go from there. 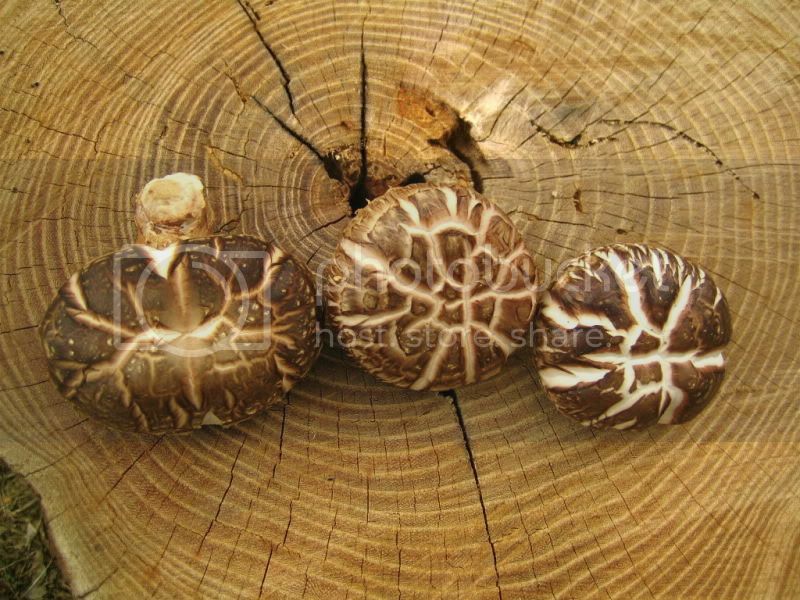 From all I've read the plug spawn in logs takes quite a long time to actually fruit, so Im hoping to maybe have some shiitake's by november or so when the weather around here starts getting cooler again. !potatoes! Looking forward to the photos. I have not been able to they the outdoor cultivation, so I'll have to enjoy the others' vicariously. 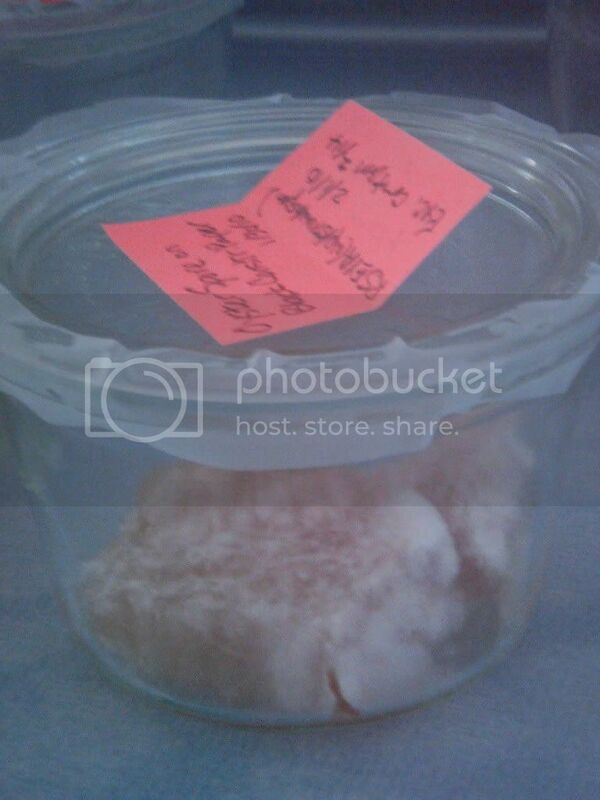 JohnK - I have admit that I was unable to repeat the experiment this winter. HOWEVER! 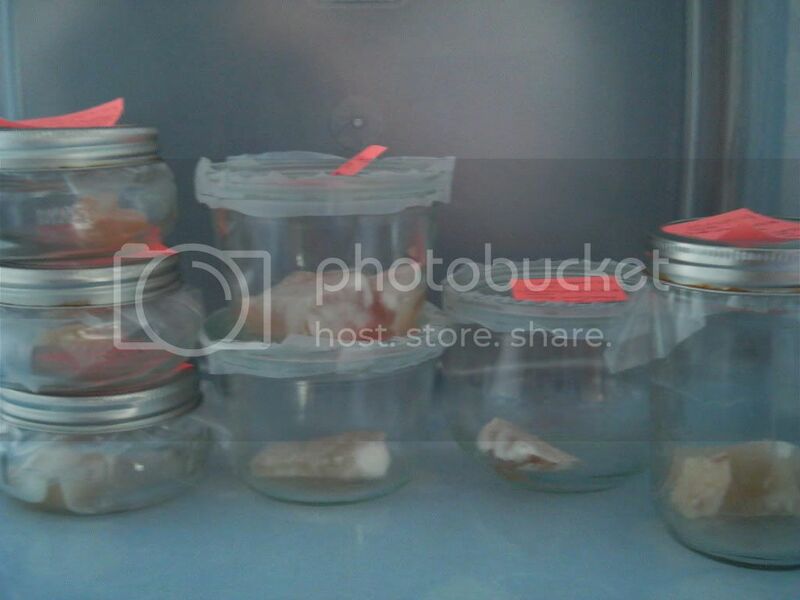 It was incredibly interesting to note that all my spawn in bags and jars in various substrate/media started to grow some time in late fall, despite a full year of complete neglect and no added moisture. I have a jar with perforated canning lid sealed with medical tape -- a tiny oyster mushroom pushed the tape aside and grew out. A block of spawn that I thought was completely dehydrated grew some mushrooms underneath, unnoticed. ...and the examples go on and on. Had I been able to leapfrog them and cultivate them in freshly prepared substrates as they started to grow, I think I might have been able to renew these samples that I had assumed were long dead. these were really crustily dry on the dark part of the upper surface until they'd sat in the greenhouse equalizing for a couple hours.